Work on the bridge has been proceeding steadily all year. 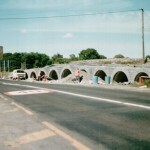 The facing of the two wings on either side of the arches and end piers were completed by the stone mason, Paddy Quinn, with FÁS workers assisting. This was done using cut stonework in keeping with the east face of the bridge and pure lime/sand mortar as would have been used historically. This work looks well and the use of the old techniques have been successful. Though easy to work with the lime/sand mortar requires greater care in use and much more protection afterwards than cement/sand work. 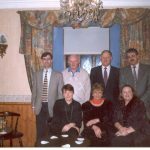 The success of the work on the bridge is a tribute to Paddy and his team. 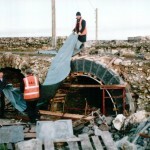 The guard wall above the arches was built by the FÁS team using rubble stonework brought to courses, faced both sides, with rubble centre and cement/lime/sand mortar. It was decided to show no mortar on the face. The wall is capped with large stones spanning the width of the wall in the traditional manner (see the earliest part of guard wall on east side). This work took care and attention to detail and the team again made a great job. 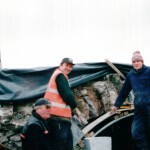 A drainage channel was dug at the back of the guard wall to prevent water draining through the wall and down the face of the bridge. Work is now proceeding with the construction of steps on the north side of the bridge and then the hard landscaping below the arches will be done. It is hoped to flood light the arches from the ground, and install some decorative lighting at street level. Iron railings and other decorative street furniture will be required for pedestrian safety and to stop vehicles entering onto or under the bridge. 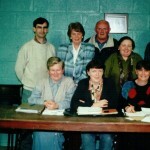 Josie Concannon, Rose Kavanagh, Larry King, Vincent Lyons & Seamus O’Connell.